You can't deny it. Clogs are so hot right now. Or maybe they're not and my finger is on the pulse of alllll the wrong trends but I've had very teeny tiny handful of readers ask me to do a clog roundup ... so twist my people-pleasing arm. I hope you read-sang that to the tune of a musical masterpiece by the master himself: Sisqo. If not -- can you share your class act with the rest of us? thanks. I started wearing clogs in earnest during Phoebe's pregnancy, I believe? And have only let weather extremities stop me and my happy habit since then. 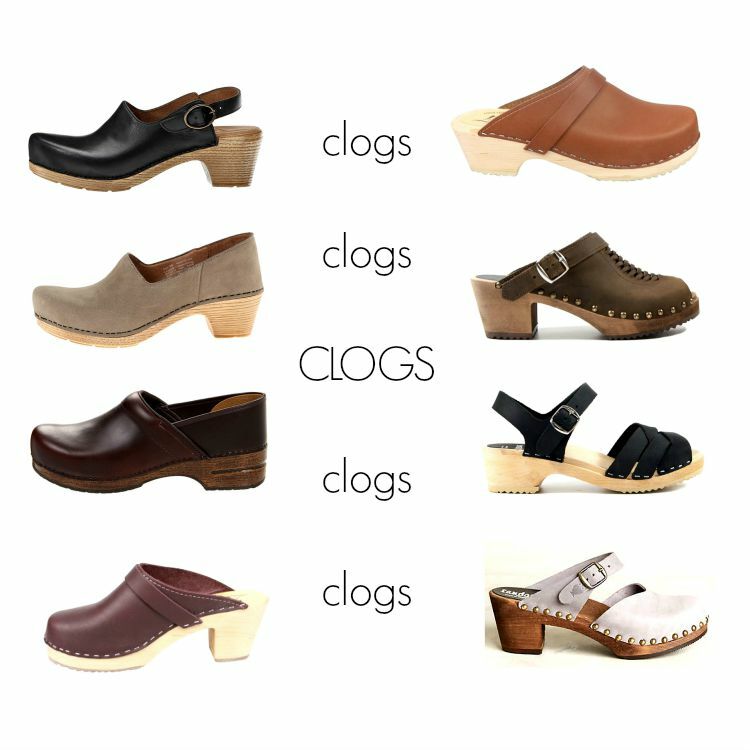 I wear them with pants, leggings, dresses, sans or with socks ... basically the sky is the limit with the clog. Yeah, Grace. You are SooooOOooOoOO crazy. Pants, pants ... AND pants!! Dansko Madison - You can't deny the crazy comfort factor of the Dansko and lately they seem to be branching out beyond their standard professional clog (which I love too - despite not being a professional of any sort). Dansko Marisol - again with the comfort and aesthetics. Win and win. Dansko Professional - love them. wear them all the time. don't care. And here's a fancier, more fun version too. Lotta Aubergine high clogs (also on Amazon) - these are my ALL time favorites. The only reason I might wish for a slight dip in temperatures is so that I can throw these bad boys on. They look pretty high but they are super comfortable, promise. Lotta low clog - added these to my collection because I saw someone wearing them and they looked GOOD. copycat forever. Sandgren peep toes - I found a pair of Sandgrens on eBay last year (not this particular pair - the camel pair in two of the photos - but I do love them) and while I don't think my particular pair are as comfortable as my others ... I still wore them all the time when I was pregnant and it wasn't blazing hot outside. Sandgren Rio Grande - Maybe I'm breaking a fashion rule here but I would totally wear these with tights. Sandgren Lisbon - these too. My ultimate ultimate clog thrift/eBay find would be to happen upon a pair of these because most ridiculous price ever. You never know, but I'll keep on dreaming. Anyway, I know I'm missing a whole grip of other, better styles. Lay it on me ... if you care. My first pair of dansko professionals lasted a decade before the sole wore off (and split in half during an ill fated waitressing shift). I bit the bullet and got a second pair and they look nearly new after 5 years. I love being able to order in narrows too. :) Given that I am so out of the fashion loop that I've been wearing them 15 years before popularity, I have no fancier styles to recommend. I received a pair of Dansko clogs when I was in college, well over a decade ago .. They are by far my favorite shoes! I bought a scuffed but salvageable pair of Dansko Mary Jane (don't know the exact model) on eBay and have been taking them to the old-fashioned cobbler (only takes cash and doesn't trust computers for sales slips!) in our town to try to revive them. Unfortunately, I seem to be between sizes in Dansko, but they're still pretty wearable for $30 (cost + shipping + unbelievably inexpensive new insoles). I bought some sandals per your recommendation the last time you did a shoe roundup....so I think I need clogs now too. Yup, sure do. But also I think I need real life advice wearing them with socks because I just can't see it in my mind...and I can't bear to have my heel open to the winter elements! More photos! My friends totally make fun of me for wearing dansko professionals with skinny jeans so I am glad to see other people are rocking the look too! Love Danskos😍 You should check out BRYR Clogs. Kinda pricey, but super cute! Danskos forever!!! With all the clothes - skirts, pants, sweats, church dresses. Everything. Fashion rules be damned. Comfort is all. And how can almost $500 shoes be sold out?!?!? How do you wear them with dresses or socks? I agree they look good with leggings and jeans but have never bought a pair because I don't know how to wear them with a dress or skirt so they don't seem as versatile as ballet flats or boots. I would love the comfort factor though! You guys-clogs-are you sure?! I could probably do a flip flop round up or ugg boot round up but you may have just convinced me to try something new and more fashionable! Oh, I have had my eyes on these...http://www.korkease.com/product.aspx?ProductID=1229 ... bought some sandals from them this Summer and loved. And I have worn my Dansko profs for well over a decade as a nurse. Same pair, and will wear them until they fall apart!